Iraqi special forces backed by US troops have killed 84 insurgents in a raid on a lakeside training camp near the city of Tikrit, officials say. A 240-strong Iraqi commando unit engaged in heavy fighting before seizing the camp, 160km (100 miles) north-west of Baghdad, on Tuesday. Correspondents say it is the heaviest blow to the insurgency in months. After encountering heavy fire from an estimated 100 insurgents, they called in US ground and air reinforcements. 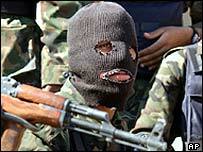 Iraqi officials said the insurgents included at least 10 foreign recruits. They said they had found passports from Morocco, Algeria, Sudan, Saudi Arabia and Syria at the camp. One casualty was said to be Egyptian. "It was one of the most successful operations we've had," said Iraqi interior ministry spokesman Sabhah Kadim. The US military confirmed the operation, but was unable to say how many insurgents were killed. In a separate operation on Tuesday in the northern city of Mosul, the US military said, 70 suspected insurgents were arrested by Iraqi forces. Iraqi special police units have been stepping up operations against insurgents in recent weeks. The BBC's Jim Muir in Baghdad says the units are made up of experienced military men who served under the previous regime. Though they are regarded with suspicion in some circles, he says, they are considered to be more reliable than conventional troops. In Baghdad on Wednesday, a rocket or mortar hit a school and exploded, killing an 11-year-old girl and injuring at least one other child. A teacher was seen weeping as parents came to pick up their children from al-Junainah school in the Amariyah district, while dust and glass fragments covered the classroom. Meanwhile agreement appeared to be drawing gradually closer on the formation of a new Iraqi government, with Shia and Kurdish parties due to meet for further talks on Wednesday.